Dubai, Known for its gigantic shopping malls, innovative architectural structures, wonderful sports facilities and luxurious holiday resorts, Dubai is truly a gem in the desert country. The city has become one the most popular playgrounds of the rich and famous, and has made many a statement with several of the world’s tallest buildings, man-made islands and even a huge indoor ski slope and all this in the middle of a desert. These fishing towns in the Arabian Gulf have gone through a lot of changes and, at present, it is one of the best tourist destinations in the world. Weather wise, the best time to come to Dubai and really enjoy the outdoors as much as you enjoy what’s inside the malls are in the cooler months of November to March. During summers, the temperature is often above 40 degrees centigrade. So be sure to discard any notion of visiting the city from May to October. The best time to visit Dubai is from November to May, that is, the winter season. During this time, temperatures only range from 25 to 15 degrees centigrade. There are lots to see and do here, not just the sun, shopping and modern buildings – you can go see the traditional (old) Arabic architecture down at the Bastakiya Quarters near the Dubai Creek or join a desert safari to experience the vast desert. 1. Make sure you have the international driving license. Of you do not have the license none of the UAE car rental will let you rent a car, because it’s a must. Every agency will ask you for international driving license; therefore leave the home town with it. 2. Always keep in mind that you do not belong to the city of you not local and locals own this city more than you. Never get into any trouble by reacting harshly to any abusive gesture by the locals. It will causes serious trouble to you. 3. 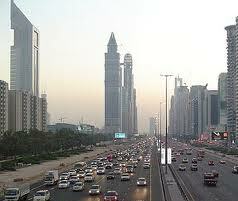 If you are a first time driver in Dubai, it is must for you to take care of the lanes. Dubai is a crowded city with crowd all over, therefore it’s necessary for you to stick to your lane. 4. While making your way to toll points, make sure you have change because most of these points do not have change. Giving extra money will either cause you the loss or will displease the officers there. The last thing anyone would REALLY want to do is go to a country as a tourist and spend a major part of it traipsing through a Mall. Mall of the Emirates isn’t the only shopping centre in the UAE with a surreal twist. 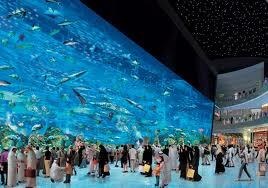 The Dubai Mall has a huge aquarium – one of the largest in the world, containing 10 million litres of water, sharks, stingrays and thousands of exotic fish – right there next to the customary high street fashion outlets, such as H&M and New Look. Visitors can take a ride on a glass-bottomed boat to admire all the sea creatures or, if they’re feeling brave, go diving with the sharks or take part in a little cage snorkeling. The Dubai Mall also has an Olympic-sized ice rink, where you can play hockey, take ice dancing lessons or just go for a sociable spin. Dubai Gold Souk or Gold Souk is a traditional market in Dubai, United Arab Emirates. World famous Gold Souk is Dubai’s Gold Souk, where narrow streets are lined with shop windows glinting with ornaments made in 22 and 24 carat gold. Along the slightly larger lanes of the gold souk, each shop window is crammed with gold necklaces, rings, bangles, earrings and brooches. On display in one of the shops is the World’s Largest Gold Ring, certificated from the Guinness Book of World Records. Designs can be traditional or modern, bold or conservative, loud or sober, sturdy or delicate. Along with designs, you will find many different shades of gold like pink, white, yellow or green hues in one piece. Dubai Gold Souk is worth a visit even if you have no intention of buying. It would be hard to resist the temptation to buy them. Haggling about the price is like a tradition. Take your time and plan 2 to 3 hours for your visit.